Barry Hager is President of Hager Associates, a legal and consulting firm founded in 1990, specializing in international finance, trade and administrative law. Based on work for the U.S. Congress and the private sector, he has expertise in U.S., European, and Japanese policies in banking, foreign affairs and economic development. He has extensive experience with the World Bank, the International Monetary Fund and other international financial institutions. Prior to founding Hager Associates, he worked for Congress for seven years, including service as chief counsel and staff director of the House Banking Subcommittee on International Development and Finance. He was responsible for all aspects of U.S. participation in and contribution to the World Bank and other multilateral development banks and was the principal staff author of 1988 legislation responding to the Latin American debt crisis. He advised Members regarding IMF quota increases, World Bank capital increases, Ex-Im Bank lending, exchange rate policy and related international financial issues. He has advised Congressional delegations to Bank/Fund annual meetings in Seoul, Berlin and Washington, and regional bank meetings in Harare, Zimbabwe, Caracas, Venezuela and San Jose, Costa Rica, as well as fact-finding trips on trade and finance issues to Canada, Malaysia and Japan. In 1987, he was selected to participate in the European Union’s prestigious Visitors’ Program, where he studied European banking and foreign aid policies. In private practice, Hager advises for-profit and non-profit organizations on U.S. legal and legislative developments which affect their interests and is engaged in a series of projects involving judicial training and introduction of systemic legal reform in developing countries in Latin America, Africa and Asia. 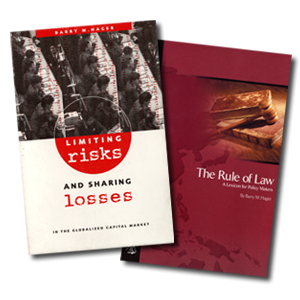 He is the author of Limiting Risks and Sharing Losses in the Globalized Capital Market, published in March 1998 by the Wilson Center and Johns Hopkins Press; The Rule of Law: A Lexicon for Policy Makers, published in October 1999 by the Mansfield Center, and numerous articles and periodical publications. He is a graduate of the Harvard Law School and the University of North Carolina and a diplomate of the Sorbonne and the Université de Lyon, France.